Catholic Cemeteries & Crematoria is proud to be a supporting partner of Sydney’s spectacular festive season tradition – the Lights of Christmas. A free public celebration across 17 nights, from December 9, 2014. Be sure to look out for our limited edition candle-like torches which will be given away free each night. 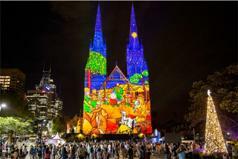 Since 2009, the majestic light and sound show at St Mary’s Cathedral has captured audiences’ attention and redefined the way Sydney-siders celebrate the festive season in a public environment. Hosted by the Archdiocese of Sydney, the forecourt of St Mary’s Cathedral, opposite Hyde Park, becomes a destination for people to gather with their families and friends and recharge their festive spirit. The 2014 show examines the notion of ‘giving’ and ‘service’ offering a time for reflection on what it means to give. We are reminded of the highly symbolic gifts of gold, frankincense and myrrh that were presented by the wise men at the birth of Jesus. This story allows us to consider the gifts we give to our loved ones and what we can give or how we can serve our community. To value and honour those who serve our community, the event education partner Australian Catholic University will be staging a special award for community service as part of their support for Lights of Christmas. For families there will be a special children’s section of the show that will feature the 12 Days of Christmas story in vivid and colourful moving imagery. The beautiful 3D digital projections that illuminate the Cathedral’s 75metre high façade, are accompanied by an especially commissioned soundscape and narrative that resonates with the ideals of the Christmas season of peace, joy and goodwill. The nightly spectacle is heralded by live choir performances from the steps of Sydney’s grandest Cathedral. In Lights of Christmas is an all weather event and has special onsite catering or BYO picnics are welcome. 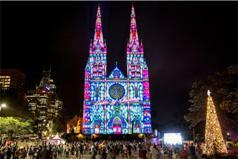 The Lights of Christmas presented by PAYCE, is hosted by the Archdiocese of Sydney and AGB Events with Education Partner the Australian Catholic University and supported by Catholic Cemeteries and Crematoria. Visit the website for more information and go to 131500.com.au or call 131 500 to plan your trip using public transport.